Going out for dinner with a healthy friend can be a little dangerous. You end up getting excited about things and then suddenly you find you’ve just committed to something that will require you to get up much earlier than you normally do. That’s what happened to me tonight. I was having dinner with my friend Christy and she started telling me about this Harvard article she’d read which listed a bunch of studies about how good walking is for you. One study found that walking a mile a day reduced risks of cardiovascular events by 81%. I’ve been wanting to start getting fit again, and I really enjoy walking. So I asked her how much walking she’s been doing. It turns out, lately it’s been quite a lot—8 kilometres, which translates to approximately five miles. And that’s how it all started. At first we thought we’d pick a midway point between us, and walk there so we could do more walking together before we walked back. But Christy lives across the city from me, which would make for a lot of walking for a getting-back-into-fitness walker like me. She also bikes everywhere, too, though. So we’ve decided we’ll start by having her bike to where I am, and I’d meet her for a nice long walk, and then she’d bike back home. It sounded good to me. I like planning things. It’s just when you start putting, well, you know, dates on plans that things get a little scary. So I now have two weeks to get used to waking up early, since Christy needs to be finished her morning exercise by 8:30 in the morning so she can start in on her work. I know I can handle the walking, it’s the waking up early bit that scares me. I’ve written before about my quest to become a morning person, but I haven’t made such great strides in that direction yet. This walking commitment is definitely motivation to get there! This entry was posted in Life and tagged exercise, fitness, morning person, walking on May 8, 2015 by Belle. During the Readathon, someone tweeted about doing some reading while walking around, to gain some energy and beat back sleepiness (I’m not sure who it was—I tweeted so much during the Readathon there are too many tweets to check!). Since I’ve been thinking a lot lately about getting into healthier habits, I found this idea of walking around when you’re reading sticking with me. It makes a lot of sense, because I’m the kind of person who likes to walk around the place when I’m talking on the phone. Of course it’s not something you can really do all that well when you’re outside, but inside is a whole different story, right? So tonight I put the idea to the test—and it works! The first Dune readalong Twitter chat is happening tonight and I wanted to get a few more pages read so I can hopefully participate (but I’m not sure if I’ve read enough yet). I was able to read about twenty pages while walking back and forth from my office through the ilving room to the kitchen (this is an open concept place, which made it even easier). The best thing? Before I gave it a try, I was sitting on the sofa reading, and feeling quite tired. But now? I actually feel refreshed! Do you walk or do other exercise when you’re reading a book? Have any tips for me? This entry was posted in Life and tagged exercise, fitness, Frank Herbert, readalongs, walking, walking while reading on April 27, 2015 by Belle Wong. I tried using a standing desk arrangement a few times last year, but never stuck with it. This time, though, I have incentive! First, I really want to start exercising and that right hip abductor muscle of mine is still not quite working the way it should yet, so I still haven’t been doing much walking. Since I’m doing so little walking, it makes sense to transform some of my sitting down work time to better-for-me standing time. Second, when I do end up doing some walking, which I have to do just to get from transit stops to my destination, I end up with a sore lower back. It’s really the second thing that’s motivated me to give this another try. My back has been sore since Dylan and I rush-walked down five blocks so he wouldn’t be late for his dance class on Saturday. It was only five blocks – and yet the next day, my back was so sore! The keyboard and mousepad are sitting on a lapdesk I haven’t used in ages, and that’s a banker’s box under my laptop and a bunch of black plastic organizers (my laptop normally sits on top of those plastic organizers anyway, as I like to have the screen at eye-level). You can’t see it, but there’s an old Wii fitness board on the floor for me to stand on; without it the keyboard is too high for me. I used this setup to write this afternoon, and my back felt fine. I’m working on an index now, and my back still feels fine. My legs, on the other hand? They feel like I’ve been walking for at least a few hours! This time, though, I’m doing things smarter than the last few times I tried a standing desk arrangement. First, I’m using the Pomodoro technique, and when that timer goes, I’m alternating between sitting down for five-minute breaks with heading over to my pilates mat to do the exercises for my core and my hip abductor muscles. And I’m trying to remember to move occasionally while I’m standing, whether it’s walking in place or heel raises. I’m going to see how I feel after a week (if I can last a week! As I recall from my previous standing desk experiments, it’s the second day that’s the killer). This arrangement is nice because it’s pretty quick to alternate between standing and sitting – I just have to get rid of the lapdesk and the banker’s box when I want to sit down to work. This is something I’ve been wanting to do for a while, because standing is so much better for you than sitting, and when I’m working, I can literally spend the entire day in a chair. This entry was posted in Life and tagged fitness, standing desk on January 12, 2015 by Belle Wong. Seven Or More Servings a Day? I’ve been on a bit of a “get healthier” track, so when I read an article in the New York Times recently about a study that suggests we should be eating seven or more servings of vegetables and fruits a day (which, by the way, I cannot find no matter what keywords I plug into Google, so here is the BBC’s take on the study), I decided to take a close look at my veggie and fruit eating habits. You’d think being married to a former vegan who does all the cooking would mean my daily vegetable and fruit intake would be more than adequate, but unfortunately that wasn’t the case at all. First of all, when my husband was vegan, he had a tendency to concentrate on proteins rather than vegetables and fruits (which wasn’t surprising, since there was also a year previously when he became vegetarian and afterwards we realized he should have called himself a “cheeseatarian”). As you might have guessed, now that he’s doing regular omnivore eating, vegetables and fruits still aren’t at the top of his list when it comes to cooking. I decided I’d better remedy my rather woeful track record of eating vegetables and fruits. When I was in my 20s, my idea of a snack was to cut up a green pepper and mince some garlic and do a quick stir fry. I’m not sure what happened between then and now, but I had definitely lost my way when it comes to healthy eating. So first things first. I had to figure out what a serving actually meant. According to Canada’s Food Guide, one serving is a medium fruit or half a cup of fresh, frozen or canned vegetables. The American Heart Association says one serving is one cup of raw leafy vegetables, half a cup of other vegetables, half a cup of vegetable juice, a medium fruit or half a cup of chopped, cooked or canned fruit. Clear enough, then: to get seven servings of vegetables and fruits a day I’d be counting half cup serving sizes, unless I’m eating raw leafy vegetables, in which case I’ll use the one cup measure. Seven servings therefore means I need to eat three and a half cups of vegetables and fruits a day (ha! I guess basic math does come in handy later in life). At first glance, this seemed to pose quite the challenge, especially since I was eating maybe one and at most two servings a day. But once I made a commitment to more vegetables and fruits, it wasn’t as difficult as I’d thought it would be. First of all, I now think “veggie” and “fruit” at the first signs of those snacking urges (I don’t know about you, but for me, these usually come when I have a book in hand). Yes, steering myself away from the potato chips (they are definitely my main source of unhealthy eating temptation) has been difficult. But then I tried the humus my husband makes for himself as a snack, and I fell in love. I pair it with lots of celery, carrots, radishes and cucumbers, and I’ve gotten so diligent I now pre-chop my celery and keep it in a container in the fridge for ease in fulfilling my snacking urges. I rely on my nightly plate of veggies and humus to make up for whatever servings I might have missed during the day. But I also now have veggies with my breakfast (zucchini stir fry with my scrambled eggs!) and of course, as part of my lunch. I’ve also been reminding my husband we do need to have a veggie component to our dinners – even if it’s just tomato or cucumber slices. And instead of my juice and flaxseed concoction I now make a fruit and kale and flaxseed smoothie (finally! I’m using that Magic Bullet I bought so long ago!) and it tastes so much nicer than what I was drinking before. And kale! Oh, kale, I hear you are so good for me. Well, except that raw kale may be problematic when it comes to thyroid issues. So I now regularly cook up two batches of kale: one in water and one in broth. I freeze each batch, and use the kale cooked in water cubes in my smoothies and the kale cooked in chicken broth cubes in my soups. Very easy. I’m sure I’ll come up with more ways to eat more vegetables and fruit. I love my vegetables and humus snack, but I’m sure variety is important, too. For me, snacking on vegetables and fruits is definitely the way to go, though! This entry was posted in Food and tagged fitness, healthy eating, vegetables on May 7, 2014 by Belle Wong. But even the best tracker can’t recognize all of your movements. As I sit writing this, my wrists are motionless, but my leg is tapping to music. My activity trackers don’t seem to notice — fidgeting won’t be reflected in the calorie counts they show me. That’s too bad, because there’s an interesting body of research suggesting that a propensity to fidget is one reason lean people stay lean. Intrigued, I clicked on the link about lean people staying lean, which talked about a study conducted by Dr. James Levine in which it was discovered lean people had a tendency to fidget and pace around, and this might be what keeps them lean. What really interested me? This fidgeting and pacing has the potential to burn about 350 calories per day, without trips to the gym! This was getting more and more interesting. Until about five years ago, I was one of those people who could eat whatever they wanted and not gain an ounce. In fact, some of my most painful years in adolescence revolved around the whole issue of being too skinny and not being able to gain weight. When I started gaining weight five years ago, I felt quite cheerful about it. For one thing, clothes shopping became much more pleasurable; clothes actually fit me, and I could stop frequenting the teenage-style stores I’d had to resort to before. It was around that time I stopped fidgeting and pacing. I’d made a concerted effort to stop doing so, although I can’t remember why. I didn’t stop completely – when in the middle of a particularly stressful deadline, you could almost be guaranteed to find me sitting in front of the computer with my right leg jiggling frantically up and down. But most of the time, whenever I sat, I stayed still. Since then, I’ve gained more weight than my body feels comfortable with. Even when I was really thin, I had some years when I didn’t exercise regularly, during which I felt unfit – I’ve always judged my personal fitness by how much huffing and puffing I do when I take the stairs. With the extra weight, I’ve been failing the huff and puff test consistently. So I’ve been on the fitness bandwagon on and off the past few years. I try to exercise regularly, but I’m just not one of those people who enjoy exercising very much. When the weather is nice, I walk a lot, and there are about three months of the year when I actually enjoy running outside. The problem is, I don’t like running when it’s too hot. Or too cold. As Goldilocks says, it has to be just right. Unfortunately, living in Toronto, Canada, means there are many months when it’s snowy and icy and about two to three months when it’s heat wave weather. In other words, I’m sedentary a lot more than I want to be. Apparently, the tendency to fidget and pace is something you’re born with. Since I had been a fidgeter and pacer up until about five years ago, I wondered if I could re-develop the habit and perhaps enhance my fitness levels. Engaging in more NEAT activities won’t take the place of a daily workout, I know, but it seems like something that fits snuggly in the “surely it can’t hurt” category. So I’ve been trying to be more aware of those times when I’m sitting and sedentary, and reminding myself during those times, “now’s a good time to do some fidgeting.” When I’m sitting on the couch reading, I’ve been doing leg lifts. At the computer, I bounce my legs up and down (I’ve been doing this ever since I sat down to compose this post). I’m planning on trying out a standing desk using some file boxes, and if it turns out I can actually type comfortably on my laptop while standing, I’m going to make this standing desk IKEA hack. Have fidgeting and pacing come back naturally to me? Before today, I would have given you a cautious, “yes, I think so.” But something today cinched it for me. My sister called me on the phone, and I talked to her for an hour and forty-five minutes (you’ve had those kinds of calls, right?). It wasn’t until a few hours later that I realized, I’d been pacing back and forth during the entire conversation. It made me wish I had a Fitbit or some other activity tracker to give me credit for all those steps! I found more ideas for incorporating NEAT exercises into your every day life here. I especially like the idea of doing strength-training exercises while you’re sitting – as a reader, I do a lot of sitting when I’m reading. Who knew that raising your heels while seated works out the muscles in the lower leg?! I’m not sure whether my fidgeting fitness plan will have any particularly noticeable effects. But fidgeting is something I do naturally, so why not put it to good use, right? This entry was posted in Life and tagged fidgeting, fitness, NEAT, pacing on March 15, 2014 by Belle Wong. It all started with the 30 Day Shred. Wait a minute. That’s not true. It all started a month ago, on the day my sister took me out for dinner for my birthday. We decided last year to give each other birthday gifts of a night out, with great company (each other, of course) and fantastic food. It’s a gift idea that works for us, because my sister is very specific about the gifts she wants, which I find challenging, and I’m very “oh, I like everything”, which she finds challenging. So last month, as my birthday gift, she took me to George restaurant. I’d never been there before, so I headed over to the website to take a peek. And realized I’d probably feel more comfortable if I dressed up a little. I tried on outfit after outfit – and they were all too tight! What happened?! Where did my waist go? Where did my svelte (well, sort of) arms go? I’d lost them! Fast forward a few days, and I’m on Facebook. I see author Carrie Harris posting an update about finishing Jillian Michael’s Ripped in 30. She loved it, lost a whole lot of inches, and is doing it all over again. Jillian Michaels. The name rang a bell, and when I went searching Amazon for the Ripped in 30 DVD, I saw the 30 Day Shred – and I realized I OWNED THIS DVD. I’d bought it earlier this year in one of those mad fits of “I’m going to start working out again, I am, I am, oh yes, I am” – and it’d been sitting on one of my shelves, unopened, gathering dust with a few other fitness DVDs I’d bought at the same time. So what’s this got to do with running? There’s some weird thing that goes on when you start working out again. I found myself doing really crazy stuff, like slipping in a Zumba DVD after I’d finished the Jillian Michaels workout. And when the weather got cooler, I found myself thinking about running again. I used to run, back before I got pregnant with Dylan. He turned nine this year, so it’d been ten years since I last ran. I took the plunge last week. I pulled my hair back, put my sunscreen on, and went for a run. By the time I’d adjusted my headphones and took my first few steps, it had all come flooding back – I remembered how much I used to love to run in the fall and the spring. There’s just something about the wind on your face, the momentum of your legs, the music in your ears, the scent of fresh, cool fall air. I’m very pleased to say my lungs stayed on course the whole time. My legs, on the other hand, weren’t quite up to the job, and I had to take a few walking breaks to comfort them. Each day, though, the running just keeps getting better and better. Today I ran without taking any breaks. My thighs aren’t too happy with me right now, but I know they’ll eventually start coming around. So that’s what happened. A birthday dinner => the 30 Day Shred => running. It’s odd how these things happen. 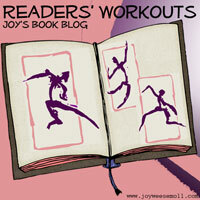 With this post, I am SO pleased to finally be able to participate in Joy Weese Moll’s Readers’ Workouts! It’s taken me a while to get back on the fitness track – I’ve definitely needed the motivation of a disappearing waistline – but hopefully this is just the start and regular updates will follow. This entry was posted in Life and tagged exercise, fitness, I'd use the tag "fitness goal" but when I use the "g" word it never works out for me, Readers' Workouts, running on September 27, 2012 by Belle Wong. Since I had such incredible success getting back into the writing habit by blogging about it (it appears that nothing is as motivating for me as saying publicly, this is my daily goal – and no, I don’t want to think about what this says about me), I foresee great things resulting from my participation in the 100-Mile Fitness Challenge. However, since Ms. Bookish is a blog about writing and reading and books, I don’t really want to post daily about my fitness progress. So I’ll write an update every few weeks (or so – knowing me, you can probably count on it being more the “or so”), but in order to publicly track my progress and keep myself accountable, I’ve added a progress meter to the outer right-hand sidebar, and I’ll keep that updated daily (I hope). So needless to say, I was thrilled that what I thought was a very long-drawn out kilometre was actually one whole mile. 2. There’s definitely a bit of unfairness to this whole running/walking on the treadmill thing. Running takes more effort and exertion, but I find I run at the same speed as I walk, so the extra exertion isn’t reflected in the actual distance measured. And no, the solution is not to run faster than I’m walking, as my dear husband suggested. See, he works out all the time and to him a mile is piffle-snuff. I make it a practice never to listen to his physical fitness suggestions because they are just highly unrealistic from my point of view. The real solution is to grin and bear that tiny bit of unfairness and don’t give in to the temptation to not run at all. 3. My initial goal will be to run the entire mile, instead of running for part of it and then walking. After I accomplish that goal, I will look at increasing my speed. Eventually I’d like to be running 1.5 to 2 miles each session, about four times a week. 4. When you get your lungs in condition, they seem to stay in condition. Leg muscles, on the other hand, appear to require continuous help on your part. This time around, my breathing is easy (according to my husband, this means I’m not running fast enough, but have I mentioned, I never listen to him when it comes to stuff like this?). My leg muscles, on the other hand, have turned all wimpy on me. 5. The moment you finish running, and go flop on the bed, is really quite an exquisite moment. I swear, I feel like I’ve just had a massage. It’s lovely. I just wish the running itself felt like getting a massage. 6. Two days obviously isn’t enough to have any visible effect on my writer’s spread (actually, mine is more of a writer’s and reader’s spread). But I can’t help doing what my son did when he first started weight lifting (which was to keep asking everyone, how come I’m not seeing any muscles yet?) My version of this is continually patting my tummy and feeling disappointed that there’s no apparent difference in, um, squishiness. If I can keep this up for 30 days, I know I’ll be able to stick with it and complete the challenge. So hold me accountable, everyone – I’m relying on you! This entry was posted in Life and tagged fitness on October 6, 2009 by Belle Wong.